Like with its predecessors, there are many collectibles to be found in Assassin's Creed 3. Treasure chests are scattered about the American Northeast, and many of them hold more than just a few coins. Each chest contains a bounty of cash, but some also include recipes, consumables, weapons and more. Sure, you can go to the General Store and buy a treasure map for each of the areas that the chests are located in, but these are expensive and we’re looking out for you so you can save some cash! 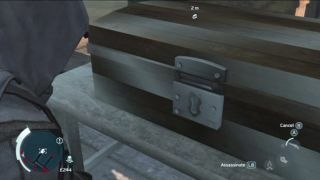 In this guide we've listed all of the Assassin's Creed 3 treasure chests, as well as provided maps showing where you can find each one. Most of the treasure chests are in easy to reach locations, however some are located in forts and will require you to use some fancy footwork and be sneaky to get to them undetected. Once you've found each chest, you'll then need to pick the lock on it to gain its valuables. If Assassin's Creed 3 Remastered has got you back on the treasure hunt, then pick a location below and get looting those crates. Like most of the Boston treasure chests, this one is easily found in the backyard of a house. Simply hop over the fence to find it against the back wall. Located in the northeast corner of the city, this chest is guarded by two soldiers. Take them out the sneaky sneaky way and then get the goods. This chest is located at the end of a dock to the east of Boston. The chest is guarded by 4 guards, but thankfully they are far enough away that you can swim up to the dock and get to the chest without alerting them. This chest is located in the corner, over a fence, in the yard of a house. It’s simple to spot and poses no troubles. This is another easy chest to reach. It can be found beside a stack of barrels and a guard dog, and is pretty much out in the open. For this chest, you will need to infiltrate Fort Hill and find the chest in the basement. This fort can be a little difficult to break into, so murder your way in and grab the goods when you reach the end of your death spree. To the far east of central Boston, you can find this chest at a congregation of British Soliders. They will be guarding the chest which is against a wall, so go to town on the guards in your way to get access to the chest. For this chest, you will need to swim over to the east docks and to the ship that is guarded by 4 guards. Climb up the side of the ship and you will be able to pick the lock of the chest undetected. To get access to this chest, you will need to complete a few Liberation Missions in Boston. Once you have completed a few of them, you will then get access to the Liberation Contact in the Central section. Enter the building at the map marker for it, and then take a walk to the second floor to find the chest. Thankfully you won’t need to pick this lock. This chest is located on the bottom level of the fort located at the marker to the far south. Thankfully, if you enter the fort from the north by hopping over the barrels and over the wall, the chest is right in front of you at the bottom of the stairs. For this chest, you will need to infiltrate Fort Independence located to the southwest of Boston. The chest in the middle of the courtyard and has a couple of guards in front of it. If you’re like me and said to hell with the stealth, just wipe out entire fort of guards and then swagger over to the chest like a boss and pop it open. This chest is located in the middle of a camp and is rather easy to access. The guards will likely be too embroiled in a battle of their own to bother paying attention to you. Once you reach the map marker for this chest, look for the stack of boxes that is beside a well. The chest will be against the stack just ripe for the picking.